HONOLULU (HawaiiNewsNow) - It’s going to be a great weekend for you no matter what you’re doing. We have drying conditions and a nice day like yesterday. The weekend is shaping up to be similiar with a dry and stable air mass over the islands. 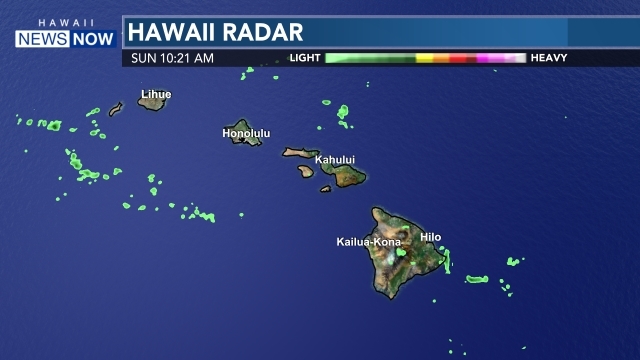 This means sunny with some cloudy periods, and a few windward and mauka showers drifting leeward at times. Surf will be below advisory levels, more on the surf below. The forecast was altered a little while ago, with lower POPs for the first half of the evening for most islands. The uptick in trade showers is expected after midnight, lasting to about mid morning, followed by much less showers for the rest of Friday. So, we anticipate Friday to be a nice day, like today for most if not all of the islands. The weekend is shaping up to be similar to today, as a dry and stable air mass stays over the area. We will enjoy moderate to locally strong trade winds through the early part of next week. A lingering front north of Kauai will finally drift south and provide a boost in trade showers Monday through Tuesday of next week. As for the winds, moderate to locally strong trades through Tuesday of next week. A break down in the trade wind comes on Tuesday night and Wednesday as front approaches the islands from the west. Surf along north and west facing shores will hold at or above March normals through the weekend. Surf will remain just below advisory levels into Friday. A pulse of north-northwest swell will build late Friday and may push north shore surf to the advisory level Friday night and Saturday. North shore surf will drop below March average late Sunday. A small north swell expected Monday night will keep the surf up for locations that favor this direction through the day Tuesday. A moderate long-period northwest swell may produce near advisory level surf Wednesday or next Thursday.